Just What You Need: Streetwise City Maps zoom in on what matters in the heart of each city: clearly marked streets, sights and public transportation routes. There is a handy street index as well. Big City Tough: These accordion-folded, vinyl-laminated maps hold their shape and are nearly indestructible. Easy-to-Use Size: Each map folds down to a handy 8½" x 4". Opened up, their width ranges (depending on the city) from 28" to 36". 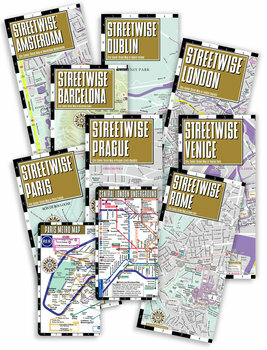 Dimensions: City maps: folded: 8 ½" x 4" open: 8 ½" x 28–36" (width varies by city) | Subway maps: folded: 5" x 3" open: 5" x 8 ½"